This father of the bride speech - sent in by a visitor to this site - is more humorous than mushy. 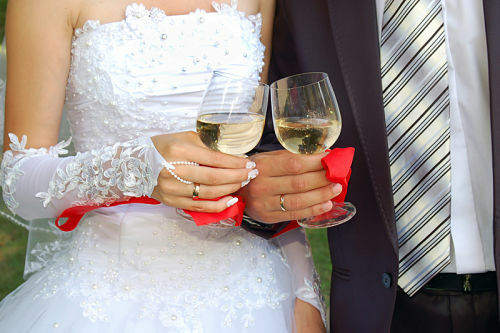 It's a funny wedding speech that might suit a family whose humor is a bit on the sarcastic side. Use this example to create your own funny wedding speech, customized with details from your own life. You might want to tone the sarcasm down a bit or not...depending on how you feel! Thank you for that introduction. If we haven't met yet, I'm Cindy's father. My name is Bill. Growing up, Cindy called me several other names - like Mastercard, Visa and American Express. First of all - Let's have a round of applause for Bob's family. That's what I said...Tim...I meant, Tim... let's have a round of applause for Tim's mother and father and the entire groom's family... there they are...let's hear it. Thank you all for coming out to this lovely event. Let's find out - who travelled the farthest? Oh, we have someone from Canada? Nice, welcome. What? Europe? Where in Europe? France? Let me ask you honestly - can you take me back with you? I don't want to face the bills from this shindig. And, of course, let's have a round of applause for the stars of the show - Tim and Cindy. Cindy looks so beautiful - right, folks? Gorgeous. Beautiful, honey, beautiful. Let's keep it going for her. And Tim, you just look... uncomfortable. Reality is setting in, right Tim? Forever is a long time. What a beautiful ceremony we had at the church today. So emotional. Cindy, it reminded me so much of that special time in my life when I met the love of my life. And then, not long after that, I met your mom. Let me just say to Tim and Cindy: you have to try to keep the romance alive. Cindy's mom and I were out to dinner last Saturday when we saw a couple holding hands and laughing together. My wife said to me "Now, that looks like a happily married couple." I told her, "Don't be so sure. They are probably saying the same thing about us." For my wife, getting married was very much like going to a restaurant with her friends. She orders what she wants, and when she sees what the other girls are having, she wishes she had ordered that. I remember that day my wife had enough of my baloney and she took out an ad in the local classifieds here that simply said, "Husband wanted." She got 100 replies - from women - they all said "You can have mine." Life goes by so fast. It just seems like yesterday Cindy was learning to walk. Can we talk? She was a mess as a kid - honestly - I'm not joking. Throwing up everywhere - piddling on the carpet - crying and sobbing all night - and that was just her 21st birthday. Tim, let me just remind you that a happy marriage is a matter of give and take; the husband gives and the wife takes. But love conquers all. You are going to fight. You have to work through it. I remember one knock down fight I had with my wife here. She finally yelled at me, "You know, I was a fool when I married you." And I said, "Yes, dear, but I was in love and didn't notice it." So let me wrap up, Cindy, by saying, I'm proud of you. You have brightened up all of our lives with your smile, your laughter, and your love of life. The day you were born was one of the happiest of my life. And now I feel the exact same feelings of love and joy I felt that day. I'm glad Tim, and his family, are now part of our family and wish you two the best in life and love. The father of the bride speech is one of the most important speeches given at the wedding. Make sure that you won't be hurting anyone's feelings if you plan on using humor in your speech. A good way to make sure is to read the speech to your wife or another female family member!